As we commemorate the sixth anniversary of the September 11, 2001 al-Qa'idah attacks on the United States, we have a new video from Usamah bin Ladin - the first actual video of him since October 2004. The release of the video also coincides with the upcoming status report to Congress by the commander of American forces in Iraq. One has to wonder if the three events are coincidental or merely serendipitous. The video is interesting and a bit different than previous videos from bin Ladin. The most important thing about the video is the "proof of life." 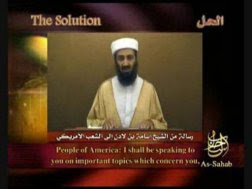 It is bin Ladin speaking about contemporaneous subjects, thus dating the video to the summer of 2007. The good news: it answers the question, "Is he alive?" The bad news: he's alive. I have watched and listened to all of the bin Ladin releases over the past years, both video and audio. In this video, he appears to have dyed his hair and beard. Although this practice is common among Arab men, we've never seen bin Ladin exhibit such vanity. Thus, it does raise questions as to why he chose to appear this way. If he had dyed the beard with henna, that would be in keeping with some Islamic traditions, as it is believed that Muhammad used henna to dye his hair and beard. The black dye is puzzling. Is it vanity, or meant to hide something? Bin Ladin also appeared to be a bit heavier in the face, but his shoulders were narrow and he seemed a bit frail, more so than I recall in the 2004 video. That said, his voice was strong and measured, actually sounding better than in 2004. His syntax was excellent - he was obviously reading a prepared text, but there were no signs of weakness in the voice. The text itself is interesting. This message is not aimed at al-Qa'idah, this is squarely aimed at the anti-war left in the United States. Bin Ladin fully realizes that his organization cannot defeat the Americans on the battlefields of Iraq, Afghanistan or possibly in the future in Pakistan - he can only defeat the United States by using public opinion. He would like for the war in Iraq in particular to stop, since the American military and Sunni tribal militias are now extracting a severe toll on his so-called mujahidin. Of note, he chided the Democrats for winning an election on the promise they would end the war and have not. He likened the continuation of the war to what he called John Kennedy's failure to end the war in Vietnam - an obvious incorrect historical reference to Lyndon Johnson. Bin Ladin also raises all the standard anti-war rhetoric - Bush lied, the neoconservatives misled, a million orphans in Baghdad, over 650,000 Iraqi dead, it's about oil, etc. He even used the phrase, "money talks." I would assess that all these references indicate the hand of indicted American traitor Adam Pearlman (AKA Adam Gadahn). The release of the video coincides with the sixth anniversary September 11th. Bin Ladin says that to convince us that the war is wrong, he has ordered an escalation in the attacks and killings in Iraq and Afghanistan, as well as elsewhere. I suspect that there are planned al-Qa'idah operations such as the one just thwarted in Germany, aimed at the American air base at Ramstein, headquarters of United States Air Forces in Europe. Combined with U.S. Army installations in the immediate area, it is the largest concentration of American military personnel and their families outside the United States. The area presents a lucrative and relatively soft target. Bin Ladin is still out there. While many of our politicians want to bring him to justice, I'd rather have American forces bring justice to him and his.